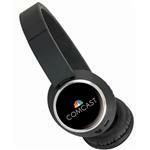 Custom Virtual Headset with your logo - the next generation of technology. Have fun with this new and unique reality tool! 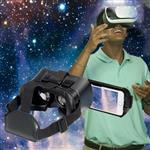 The Virtual Reality headset includes headphones that plug directly into your smartphone. Now all of your senses are engaged into the virtual reality world! Simply download any "Virtual Reality" App or "3D" App on your smart phone to begin your virtual reality experience. The padded headset allows you to experience virtual reality in comfort. The adjustable head strap makes it “one size fits all”. The Virtual Reality headset fits all 4-6.5” phones, this includes the iPhone 7 & 7 plus, HTC One, and Nexus 6. Please note that your case may need to be removed. One of our favorite virtual reality pieces. The Virtual Reality headset includes headphones that plug directly into your smartphone. Adjustable head strap makes it “one size fits all"
The Virtual Reality headset fits all 4-6.5” phones, this includes the iPhone 7 & 7 plus, HTC One, and Nexus 6.